And the realist adjusts the sails." I’ve heard that to find your limits you must be willing to fail. That was my goal with this race: to find my limit by setting a goal that I felt was beyond my limits, but that may be possible on my best day with all else being perfect. 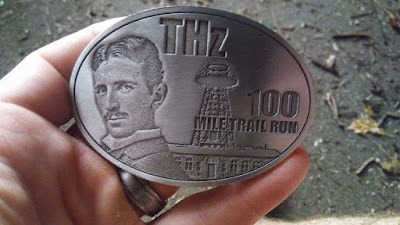 With this thought in mind and this thinking, I looked at the Tesla Hertz trail series and the course record for the 100 mile distance, 19:22:08 set in 2014. Considering my previous performances at the 100 mile distance (two races: TARC 100 and Eastern States 100) I decided that a sub 19 hour 100 miler and a new course record was a fitting goal. This wasn’t just shooting for a 100 mile pr for me, but improving it by over 3 hours. 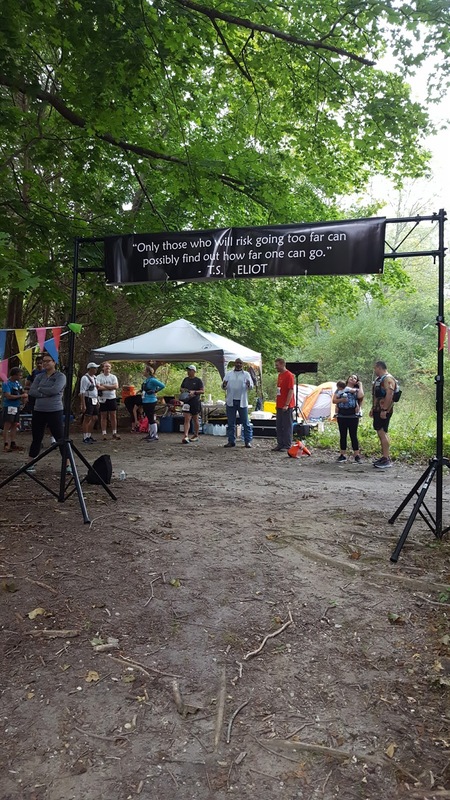 Looking at the difficulty of the previous 100 milers I had run this goal didn’t seem ridiculous to me, but still somewhat lofty and would require me to push myself to my limit or fail. At times during the race I thought I would reach it, but gradually it began to slip out of reach and ultimately I fell short and failed. However, with that failure I reached my overall goal of pushing myself to my limit and failing which was satisfying and confirmed that my goal was exactly where I had intended it to be: achievable, but just slightly out of reach. 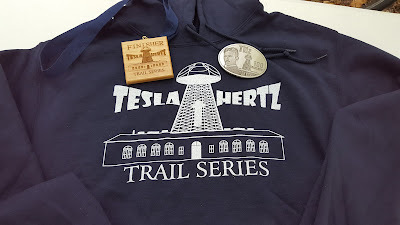 The Tesla Hertz Trail Series is a younger multi distance race with the first running of it in 2013. Managed by the Happily Running race company, the Tesla Hertz series offers 10 mile, 50k, 50 mile, 100k, and 100 mile distance options on a relatively flat trail loop of just over 10 miles. It takes place at the Rocky Point State Pine Barrens Preserve in Long Island, NY. The course is entirely single track trail with a short (about 1 mile) out and back to the mid loop aid station right around the halfway point of the course. The course has a few short hills, but is for the most part flat with somewhere around 240 feet of gain per 10 mile lap according to my Garmin data. The course isn’t technical. There are some roots and rocks as you would expect on a trail, but entirely runnable. However, the one aspect of technicality that this data doesn’t show is all of the twists and turns on the course. Very little of the course is a long, straight runnable stretch where you can just get into a rhythm and feel the flow of the trail. It is almost constantly twisting and forcing you to lean into turns to maintain a pace and stressing your hips. Prior to registering, I had almost no intention of running another 100 miler in 2017 after Eastern States. I have to admit that one of the strongest motivators for me to register was the post race blues I faced after finishing Eastern States and the PA Triple Crown Series. That series had been a goal for me for nearly two years and as psyched as I was when it was achieved, I felt a bit empty and lost when it was over. I found myself browsing ultrasignup looking for nearby 100 milers to fill the void. Shooting for a PR at the distance and a course record at Tesla Hertz seemed to fill that void perfectly so I went for it. Training for Tesla Hertz was much different than my lead up to my previous two 100 milers. The short time period (about 7 weeks) between Eastern States until Tesla Hertz just didn’t allow it. I had some recovery time after Eastern States before really hitting training hard again which only allowed for a few long training runs, the longest of which was 26 miles. I used a different approach and made my training sessions harder rather than focusing on time or distance hoping it would pay off. This new training approach made me a bit apprehensive leading up to Tesla Hertz, but I felt it was the best approach I could use with the time I was allowed. On top of this, about a week before the race I began feeling a bit of a cold coming on. I had some congestion, a drippy nose, and the fog that comes with a head cold. I almost, with the advice of my wife, decided to call it off and not even make this attempt that I had planned. However, about two days out and on the verge of canceling my hotel reservations, I realized I had missed the deadline to cancel the reservation without charges. I figured “what the hell, might as well show up and see what happens”. With that mindset, I made the drive with my family to the hotel in Long Island, NY and tried to prepare myself mentally for what laid ahead. Waking up for the morning of the race, I felt like I was over the worst of my cold. There was still some remnant congestion and headache, but I did my best to minimize my thinking of how it would impact my performance. I ate some leftover spaghetti and got prepped to run. After arriving at the race start I got my bib and schwag shirt then awaited the start. 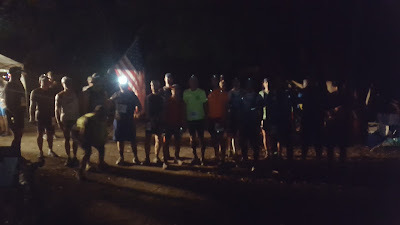 After a short pre race speech and an inspiring quote from the race director (Vinny Capp) we were off following the glow sticks that marked the start of the course. It was a small race with only about 25 runners starting the 100 miler and I found myself going out in front to meet the pace (about 11 minute miles) needed to meet my intended goal. A short time later, maybe after 2-3 miles, another runner flew up behind me and passed quickly. I guessed he was probably doing around 9 minute miles. I decided to pick up my pace a bit to see if I could at least keep his light in sight. I was doing around a 9:30 per mile pace and he was still pulling away. I wasn’t willing to push any harder so early in the race and risk destroying my race plan so I let the other runner pull out of sight. I saw him again when he was on his way back from the out and back and I was on my way out. At that point he was less than a half mile ahead of me so I figured I would aim to maintain the pace and see what happened over the next 9 laps. A distance of over 90 miles is more than I am willing to chase anyone or be chased by someone. Here's the inspiring quote from the pre race speech. I hit the first aid station, refilled my water bottle, ate a gel and took one to eat on the trail. This was my nutrition plan for the early laps of the race: a gel at each aid station and one between each aid station. 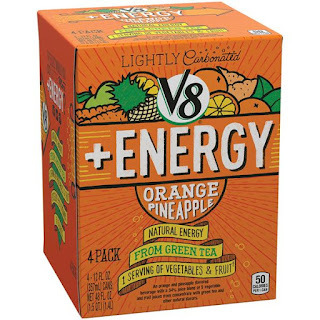 This would give me 400 calories per lap in addition to whatever calories I was getting from the Skratch that was provided as the electrolyte hydration at the aid stations. This plan would give me over 200 calories an hour if I followed my intended pace for the race. It went well and I felt good for the first 3 laps and it showed in my pace which was way faster than I had intended. Then my stomach started to feel a bit queasy on me. I chalk this up to a few reasons. First, the day was getting warmer, unseasonably warm for October. Second, I was pushing a pace a bit faster than I had intended to hit my goal. I had finished my first 3 laps in under 5 hours, putting me on a pace to finish in under 17 hours. Additionally, this meant I was flooding my stomach with more sugar from the gels than I had intended. Third, I didn’t eat as much solid food before the race as I probably should have. And fourth, I still wasn’t at 100% after a week of battling a cold. All these factors probably contributed to the upset stomach I was experiencing so I did my best to adjust. I eased off the pace a bit and forced myself to eat the least sugary food available at the aid stations, potatoes. The worst of my stomach issues was during the fourth lap. Additionally, it was also during this lap that the mental challenge of repeating a looped course started to bother me. By this point I had seen half the course in the dark and the entire course in the light twice. I tried to comfort myself by thinking about how the course will look slightly different as the light and shadows change throughout the day. Also, by thinking about how I would be able to focus on different aspects of the trail on the multiple loops. Neither of those two strategies worked well. The best strategy I found for me was to reward myself with something at every completion of a lap. Since the start/finish area also acted as the second aid station on the course, I had my drop bag there and some treats in it. During the third lap, I willed myself on by thinking about how great it was going to be to kick my shirt off at the aid station and run through the rest of the heat of the day shirtless. During the fourth lap it was drinking a bottle of vanilla iced coffee out of the cooler I had next to my drop bag. Then I gave myself a bonus treat by dipping my hat in the icy cooler water before heading back out. My proverbial carrot on the string for the fifth lap was an ice cold V-8 fruit juice energy drink and another dip of my hat in the cooler. The incentive I used to push myself during the sixth lap I had planned before the race, before I even knew I would be using this quid pro quo mental strategy to get over the challenge of the looped course. 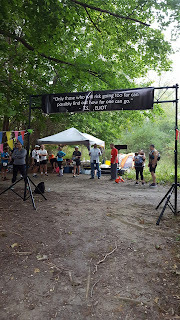 This piece of encouragement was exchanging my hydration belt for my hydration vest, which had my mp3 player in one of its pockets. So refreshing after 40 Miles of trail running! Plus caffeine to keep you alert through the night! With my vest on stocked with music, I waited until I had passed the aid station and halfway point of my seventh lap before putting my earbuds in and starting the seven hour playlist. The music definitely did make an impact. The Hatebreed songs and Mudvayne’s “Determined” motivated me to push my already tired legs beyond the exhaustion and pain that comes with 70 some some miles of flat and curvy trails. I got emotional and thought about my family and my wife and how integral she was in allowing me to run this race when Chicago’s “You’re The Inspiration” played. It lifted my spirits at times and I found myself running through the woods in the dark laughing and singing along to Rick Astley’s “Never Gonna Give You Up”. 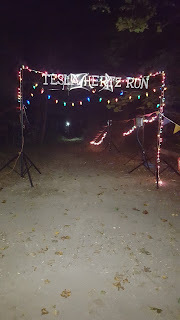 I did the best club dancing I could do while trail running in the dark when the Marshmello songs were playing. However my favorite and what I found most motivating to run with were the Eminem tracks. Running with music felt like a huge plus for me during this race. I think they made the last 3.5 laps far more enjoyable than they would have been otherwise. With seven laps complete, I was just under 13 hours into the race putting me right at target pace for a 19 hour finish if I could just maintain a pace of two hours per lap for the last three laps. However, by this point hitting that 11 minute per mile pace was a struggle. I had started mixing in some walking intervals to lessen the pain resulting from the constant impact of running on flat terrain. My body wasn’t prepared to deal with that kind of pain following Eastern States where so much of the course is spent climbing which is physically draining as well, but is nowhere near the same effect as the constant impact of the repeated footfalls of running a flat course. With this run/walk strategy, sub 12 minute miles felt like success. I wasn’t willing and probably wasn’t capable of it at the time to do the math to determine if this pace would be enough to get me to the finish within that 19 hour mark. I continued this strategy until near the end of my eighth lap when I caught up to a runner with a set of flashlights that looked familiar. The only runner that had passed me all day was the other 100 mile runner who passed me during that first lap. He also had been using what appeared to be a pair of flashlights. According to my exhausted brain, this had to be that same runner which would mean that I had finally caught up to him and was about to be in first place. I passed him and decided I would push myself without any walking intervals the remainder of the lap to the start/finish aid station to create a gap between us. I rushed through the aid station constantly looking back at the trail for any lights. I figured if I got out of the aid station before he got there it would lessen his will to chase after me. I continued to push for the ninth lap with my goal being to get through the out and back without him seeing me. I pulled this off and thought to myself that I now had at least about a mile gap on him. When he got there and realized the gap between us he certainly wouldn’t want to chase me for the last 15 miles. The finish line after dark. Even with what felt like pushing myself to the limit while running scared my eighth and ninth laps were both still about 2 hours and 10 minutes each which put me just a little over my 19 hour finish goal. I had told myself that I would push for the last lap if I needed to meet that goal, but the increased effort during the last two laps had taken a lot out of me. I tried but just didn’t have what it took to increase my pace for the last lap. At the final aid station during that last lap I knew my 19 hour goal was beyond reach. I rewarded myself for my effort and prematurely celebrated a bit by doing what I had been tempted to do upon every passing of this aid station that is named the “Whiskey Girl” aid station and took a shot with the lone remaining volunteer. The green label Evan Williams was delicious and went down surprisingly smooth after what I had put my stomach through for the last 18 hours. After the shot and a fist bump I was off to wrap up the last five miles til the finish. My legs were a bit wobbly before it, but the shot made the wobbles feel more fluid and numbed the pain a bit. I happily continued on until about three miles from the finish when I caught sight of a light in the distance behind me. I panicked. “He caught me” my mind screamed. I pushed hard trying to not let the light get closer, but every time I let up the light appeared again. This continued until I crossed the finish line physically and mentally drained with an official finishing time of 19:41:33. It wasn’t until after having a seat and chatting with the race director a bit that I realized the runner I had been chasing and running scared from for the last three laps was a ghost. The first place finisher had finished an hour ahead of me. That runner I had passed with the same lights as the runner that had passed me so long ago was either running a different distance race or was a 100 mile runner that I was lapping. Either way, it had no effect on where I placed at the finish. Regardless, it was great motivation for me to push myself for those last three laps. I’d be lying if I said it didn’t disappoint me, even if winning the race wasn’t my goal. The beauty of it is that it helped me to achieve my primary goals. It forced me to push myself when I thought I had nothing left. The lofty goal that I had set was beyond my reach, but I never gave up and gave it my all to grasp it even as it slipped out of reach during those last thirty miles. 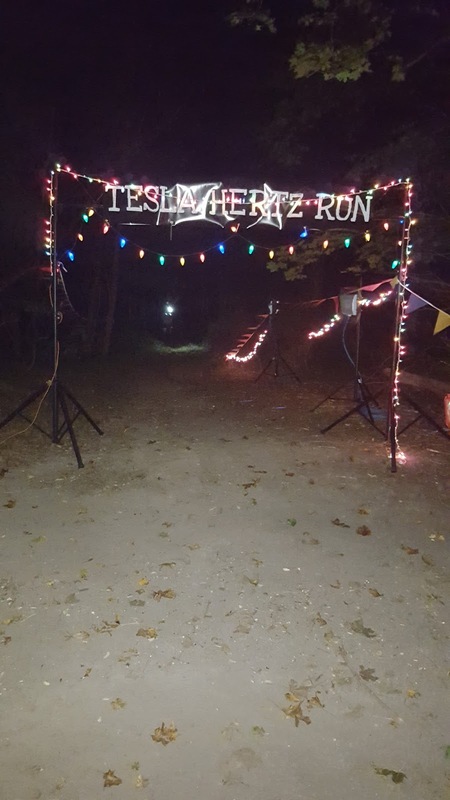 The Tesla Hertz 100 cured my post race blues and helped me prove to myself what I am currently capable of at the 100 mile distance.